The mindset used to create change. A lot of times our beliefs impact our actions which in turn impacts the way we view and perceive the world. This means that what we think will happen, often times ends up happening, which only strengthens those thoughts. One very common example of this is the Placebo Effect. The Placebo Effect refers to studies where participants are randomly organized into different groups where one group isn't given any medication, another group is given a new medication, and a third group is given a Placebo (usually a sugar pill). Participants are not told what group they are a part of in these studies in order to avoid bias. The groups are observed over a specific period of time to see how effective the medication is at treating the illness it is intended to treat. Often times, members in the Placebo group will report an improvement in symptoms because they believe that they are taking a real medication and believe that their symptoms will improve and so notice improvements. "the mental construction of our daily activities, more than the activity itself, defines our reality" (Shawn Achor, The Happiness Advantage). As we now know, how we view activities and events in our lives deeply affects how we interact with them. The second piece to this puzzle is the power we use to create change. And this starts with how we view intelligence. If we view intelligence as a fixed entity, something that we cannot change with practice, and education then our measure for success is fixed; it has a glass ceiling. However, if we view our intelligence as something malleable that can be changed with practice and education then our ability to succeed and grow is wide open; there is no glass ceiling. People who believe that their abilities are malleable believe that they can bring positive change, which increases motivation and job performance. The question is, how can we use this belief system to our advantage in order to create positive change in our lives. One of the best ways to use this belief system is to use it to focus on our strengths in times of weakness. For example, some people might not be good public speakers and might feel very anxious speaking in front of a crowd. If those people spend their time before their event focusing on this negative weakness then they are sure to go on stage more nervous and anxious than someone else who does not have these same fears. As a result of this increased anxiety, the person will make mistakes during his/her lecture which will only strengthen the thought "I am not good at public speaking". However, if that person instead focuses on one of his/her strengths (e.g. "I know the research in this presentation") then s/he will go on stage feeling more confident which will most likely lead to a better lecture. Another common example is how we view office meetings. If we go into a meeting thinking "this is a waste of time" or "this is so boring", then time will most likely go by slower, we will not pay attention to the material presented, and we will not learn anything from it. But if we change our beliefs about the meeting and instead turn our thoughts into "what are 3 things the meeting leader is doing that work well" or "what can I learn from this presenters style of presenting" then we will become more engaged in the meeting, time will pass by faster, and we will absorb more information. The way that we look at our lives, and the information we choose to focus on strongly impacts our motivation, our behaviors, and ultimately the outcomes of what we do. It is vital to be able to look at things through a positive lens and to focus our energies on the positive aspects of our lives if we want to lead successful and fulfilling lives. Please feel free to reach out if happiness is not a consistent part of your life and if you would like help in achieving more of it. 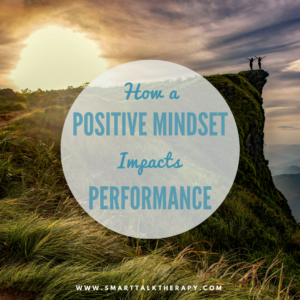 Everything that you have read about in this blog was derived from the book The Happiness Advantage by Shawn Achor. We have no personal or professional stake in this book; it's just a good book. Since striving for happiness is a strong human need we will be focusing this month's blogs on how to achieve it. We continue to accept new clients from Illinois (Chicago), California (Los Angeles, San Diego, Orange County, Santa Barbara, San Francisco, Sacramento), and outside of the USA (Canada, Australia, New Zealand, England, Ireland, Scotland, Wales, United Kingdom, Germany, France, Spain, Mexico).